is aluminium really best choice for your boat? We think it is! Choosing the best pitch and diameter propeller for your boat is tough enough (read Outboard Expert: The Right Propeller, to find out how it’s done), but to make things even more complex you’ll also have to choose the best material: aluminum or stainless-steel. And yes, it does matter. 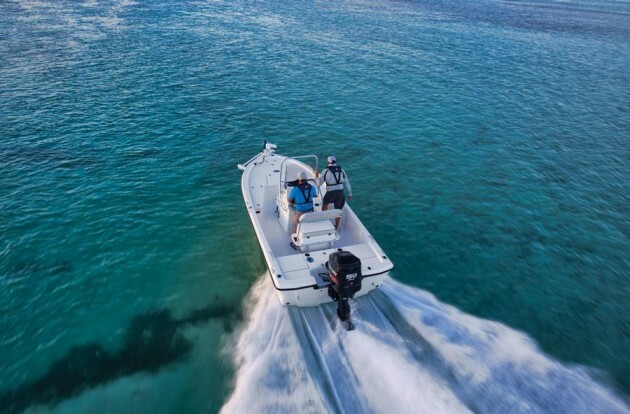 Performance, efficiency, reliability, and overall cost are all factors that come to bear, and making the wrong choice can have a pretty dramatic effect on your boating experience. So, how will you decide? Let’s find out. ALUMINUM PROPELLER PRO – They’re less expensive, often to the tune of hundreds of dollars. In fact, in many cases the aluminum version will be half the cost. ALUMINUM PROPELLER CON – Aluminum just isn’t all that tough when it comes to physical contact, so an aluminum prop regularly exposed to brushes with sandbars, small rocks, or even muddy bottoms will get dinged, damaged, and worn down in no time. STAINLESS-STEEL PROPELLER PRO – Stainless-steel propellers are far more durable. They will last virtually forever, unless you strike something hard enough to cause damage. So you could end up buying two or three aluminum “wheels” when one made of stainless-steel would have lasted at least as long. STAINLESS-STEEL PROPELLER CON – In some cases, that extra strength can be problematic. If you strike something hard those blades simply won’t give, and the forces get transmitted right into the lower unit. If the striking is hard enough, the damage that results could require costly repairs—far more costly than just buying a new propeller. ALUMINUM PROPELLER PRO – There’s a huge range of aluminum props out there, for all but the largest horsepower ranges. No matter what shape or type of boat you have, it’s virtually guaranteed there’s an aluminum propeller made to be the proper fit. Wider bladed models designed for pontoon boats, four-bladed models designed to improve hole-shot or maximize trim on bass boats—no matter how specialized you get, there’s probably a model out there that fits the bill. ALUMINUM PROPELLER CON – There’s one big exception: if you need a vented propeller, you’re out of luck. Vented props have holes behind the blade which introduce bubbles to the blades, adding turbulence and allowing the propeller to spin a bit faster. It’s a helpful feature for boats that may have difficulty getting onto plane, since it allows the engine to turn at higher RPMs as power is applied. STAINLESS-STEEL PROPELLER PRO – Stainless props provide better performance, because their blades flex less. In fact, it’s quite common for a stainless-steel propeller (all other things being equal) to out-perform an aluminum propeller by as much as five MPH at top-end, and two to three MPH at cruising speeds. STAINLESS-STEEL PROPELLER CON – Historically, better performance was the main selling-point for stainless-steel as the material of choice. It should be noted, however, that with new alloys and casting techniques, the difference isn’t as dramatic today. In fact, a well designed and built aluminum propeller can, in some cases, out-perform an average or dated stainless-steel design.